Firstly, this app should, by all means, encourage you to invest. Investments can single-handedly prove to be the first step towards getting rich. Investing your money allows growth and helps you raise your standard of living. We all are a part of an ecosystem in which everyone wants to improve their standard of living. Each member of this system has a unique way to go about it. Some have multiple jobs, some work extra shifts, others have a side business going on, while some save, and some invest, and so on and so forth. To get rich, however, one should know how money works. What if there is a simple app that lets you earn extra money? What if that app, in itself, can be a financial planner for you? What features should this ideal app consist of? The stock market is a good means to invest your money. To everyone who is skeptical about the stock market, here’s something to ponder upon. Investments like fixed deposits, debentures, government bonds, and so forth are undoubtedly safe, but investing in the stock market would give better returns. The aim here should be to beat inflation, and nothing beats it better than the equity market. The app, hence, must contain all the tools for an investor to make informed decisions. The trading app consists of all information about the market, charting tools, advanced research about certain scrips, and more. Another type of investment which beats inflation over the long-term is mutual fund investment and there are many alternatives available within this avenue itself. You can also go for SIPs (Systematic Investment Plans), which enable the investor to have periodic investments in smaller amounts. Hence, the app should provide you with all information about the funds available to invest in, past trends, and values, etc. The aforementioned investments are study-centric, i.e. they demand technical knowledge about the products. Other avenues like trading in futures and options, insurance, etc. should also be available in the app. One of the things necessary for investment awareness is comparison. The investor must compare products to select the best one. Thus, an app should contain an interface which makes comparison easy. Investing is one thing, but the next important step is to follow up on these investments. It is necessary to know when to exit the market -- be it any security (investment). Tracking your portfolio with a single click makes it all the more easy to take such decisions. All information about your open positions is obtained on a single page that shows the net worth of these holdings. 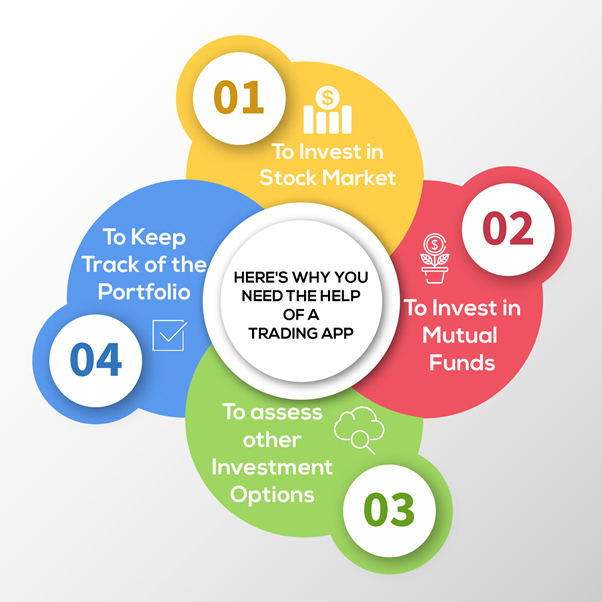 It can be said that the app requires being an all-in-one stop, ranging from stock, equity, index and currency, futures and options, mutual funds, and insurance, etc. Investors should also be able to participate in online trading using the app.